Date is exactly "Circa 1928"
A photo of the oval track and athletic fields at AUB. A photo of two pyramids in Egypt. A photo of the Roman ruins at Ba'albek. A photo of a fountain among the Roman ruins in Baʿalbek. 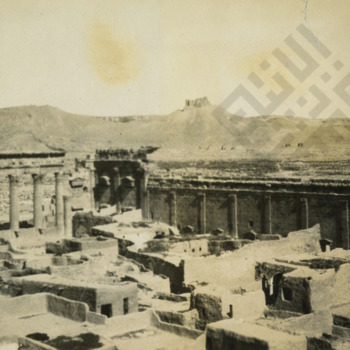 A photo of an unidentified man among Roman ruins in Baʿalbek. A photo of people in Jerusalem who seem to be by a street stand. A photo of people on the shore of an unidentified body of water. A photo of a wall and tower in Jerusalem. A photo of an unidentified street in Jerusalem. A photo of Linn Creighton posing in a garden in Jerusalem. A photo of a man and oxcart at the intersection of Folgueras and Azcarraga (now Carmen Planas St. and Recto Ave.) in the Binondo district, Manila, Philippines. A candid photo of a woman looking outside from a covered porch. A holiday greeting card from the Leavitt family who was associated with the American University of Beirut. A photo of Linn, Roger, and Phyllis Creighton in Alexandria, Egypt. A photo of Linn Creighton feeding a deer in Richmond Park, London. A photo of Phyllis, Roger, and Linn Creighton posing in Richmond Park, London. A photo of Phyllis Creighton in Kew Gardens, London. Her brother Linn Creighton stands in the background.